INSOL Europe’s Council has direct contact with the EU. One of the key goals of the association is to make submissions and contribute to the work of the European and other international official bodies who are affected by the insolvency process, or who have a role to play in the saving of businesses and jobs. If you would like further information about the work we do in connection with the EU please contact our Director of Administration, Caroline Taylor. 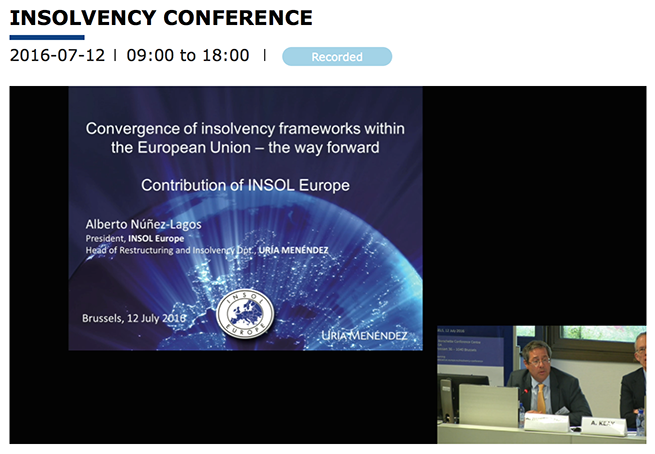 Alberto Núñez-Lagos Burguera spoke about the Harmonisation of Insolvency Officer Holders at the recent European Commission conference held in Brussels on 12 July 2016, entitled 'Convergence of insolvency frameworks within the European Union - the way forward'. Watch Alberto's presentation here (at 2.38) and find out more about the conference here. Read about the recently published report here. This report was prepared by an INSOL Europe panel of experts at the request of the European Parliament, Direcorate General For Internal Policies, Policy Department C : Citizens' Rights and Constitutional Affairs. INSOL Europe would like to thank the following member contributors: Giorgio Cherubini (Italy), Neil Cooper (UK), Daniel Fritz (Germany), Emmanuelle Inacio (France), Guy Lofalk (Sweden), Myriam Mailly (France), David Marks QC (UK), Anna Maria Pukszto (Poland), Barbara F H Rumora Scheltema (The Netherlands), Robert Van Galen (The Netherlands), Miguel Virgos (Spain), Bob Wessels (The Netherlands) and Nora Wouters (Belgium). Other reports by INSOL Europe on the European Insolvency Regulation can be found here.